Richmond, located in the London Borough of Richmond upon Thames, is known as the ‘jewel in London’s crown’. It isn’t hard to see why, as the picturesque town is located only 10 miles South West of Central London. As a result, Richmond plays host to some incredibly opulent and impressive houses! Enhancing these beautiful homes with the wide variety of benefits shutters bring truly is a passion of the team at Just Shutters Richmond. 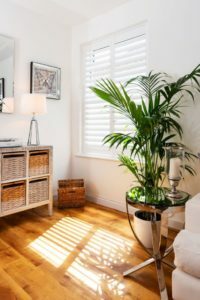 The Just Shutters Richmond team, run by husband and wife team Simon and Georgina Broadhurst, know the Surrey and London area exceedingly well. They are experts in the latest interior design trends and stylish looks that the area is renowned for. Get in touch with the team today on 01932 500270 to start your Just Shutters journey! Alternatively, use the buttons below to book your home design visit or download a free brochure. The number 1 choice for shutters! As a company, Just Shutters are unrivalled in terms of our service and product offering. We stock the most extensive range of shutters in the UK – including our own ranges you won’t find anywhere else! -Ease of cleaning: save time on household cleaning but just wiping shutters clean! -Durability: shutters last many years! Therefore, we offer a lifetime guarantee on our products. -Child safety: Shutters are entirely safe around children. Consequently, they are perfect for busy family homes. -Security and privacy: the installation of shutters will enhance the security and privacy standards of your home. -Insulation: there will be a reduction in heat loss and noise pollution when shutters are installed. Furthermore, our shutters are completely bespoke and made to measure. Therefore, you can rest assured that they will suit your home perfectly. Contact Just Shutters today on 01932 500270 to start your Just Shutters journey.